Oh man, that is nice!! I loaned my real steel 39 to Matsuo and he made a remarkable reproduction of it inc. the white simulated ivory grips. The serial # of my personal pistol has been reproduced in resin copies in the hands of Aliens collectors far and near. Check with Matt if you are interested. Side by side you cannot tell between my real 39 and Matt's reproduction of it. Here's a shot of some of my stash. 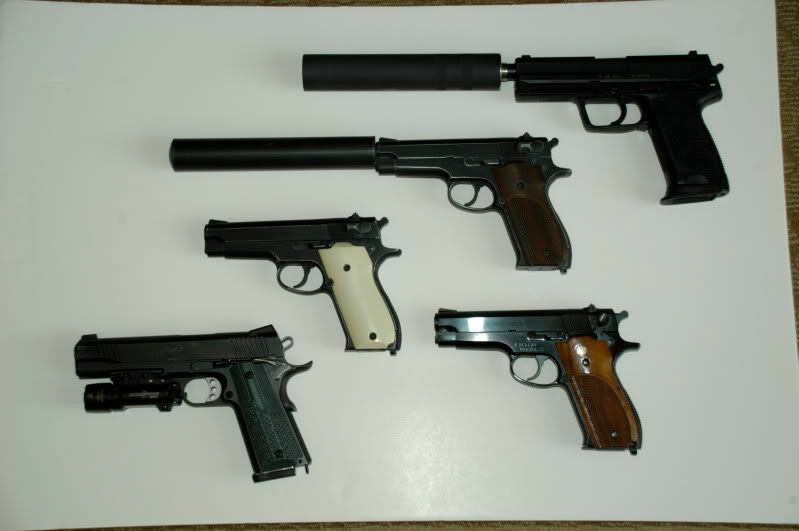 Can you tell the real gun(s) from the replica(s)? The white gripped 39 is Matsuo's replica. I wish these were availible over in the UK. If i were to guess if there are any more replicas, i'd guess that the the second from the top is a replica? Matsuo is an artist. If only i can get him to do a Blade Runner blaster in his cold cast metal technique. Correct. The Smith and Wesson 39 with the white grips and the one with the replica suppressor are from Matt. The rest are real firearms. Thanks for the background and the outstanding photo (as usual), Eltee! All the replicas i've seen from Mat look top notch. Love 'em. Crossed this one off my wish list (just arrived)! I picked up a very nice MGC plug fire cap version of this pistol recently. I already had 2 silver m39's that don't fire caps (dummy versions) and really wanted one I could run caps through, and slap the grips on. I just need to get the grips now, and I'm all set!